I’m a big fan of themes. And connecting areas of my life together to create one coherent whole of awesomeness. That tendency has led to this week’s meal – an ancient Roman feast. Many years after the fact I decided to watch Rome. I’m a solid TV binger so I watched all 22 episodes in about a week. As as result, I began thinking about Roman food. Naturally, this led to internet-land where all things can be found. Recipes were found! Real recipes, that were translated from Latin and held no historical inaccuracies. Seriously, if there is a reference to tomatoes, that is horribly incorrect. Horribly – those are native to the Americas. Fortunately for me, while Romans enjoyed eating dormice (totally a thing) and songbirds, they also ate veggies. 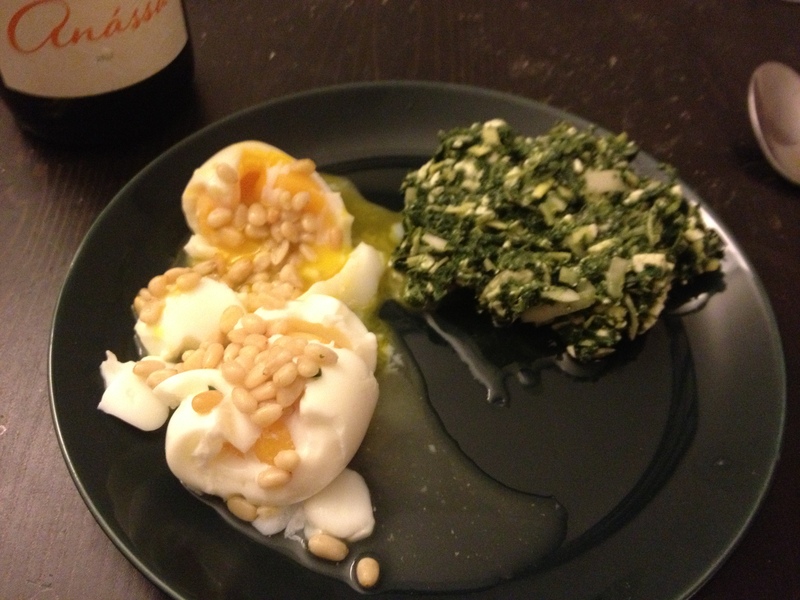 As a result I was able to cobble together a sort-of-accurate Roman meal for myself. I ended up with two dishes: one egg dish and one salad. The egg dish was extremely simple. I adapted it from this recipe. When in doubt, I assume PBS knows what its talking about. My bastardized version was very easy. Soak a handful of pine nuts in a couple tablespoons of white wine vinegar. Soft boil a couple eggs. A major irony of my life is that I am an amazing cook and yet have issues boiling eggs. The method in the recipe worked fairly well (put eggs in water, bring water to boil, and boil for 3-5 minutes. Plunge immediately into cold water), although look elsewhere if you prefer harder cooked eggs. Once the eggs are done, add some honey to the vinegar and pine nuts, and blend it all in a blender. I don’t have a blender – I tried using a standard handmixer and that failed horribly. I ended up just spooning the pine nut mixture over the eggs. The salad came from here, with of course a few modifications. I took a cup of frozen chopped spinach and de-thawed it. With that I added 2 pinches of thyme, some black pepper, half of a medium leek, thinly sliced, and a some mint, about 2 tablespoons chopped. Since I didn’t have a mortar and pestle, I mashed the ingredients together the best I could using a wooden spoon. Then I added some feta cheese and mashed that in as well. Add a little white wine vinegar and a splash of olive oil and you are good to go. The whole meal was delicious. Even without being sauce per se, the pine nut egg thing was yummy (next time more honey though) and the salad was awesome, albeit a little dry, and a little salty. It tasted best when I scooped it onto fresh bread, but it was still a solid 9 out of 10 when eaten by itself. You could also bake it on top of pizza dough or pastry dough, which I imagine would be delicious and am making a mental note to try very very soon. Roman food, of course, must be served with wine (beer was considered barbaric). I had an internal debate over what would be the most accurate type of wine – I decided on a Greek white I had recently tried and enjoyed. Any Italian or Greek wine would be close to historically accurate I presume. In theory I could have also attempted to make honeyed wine, but if I was going to that far, I’d just buy mead and serve it with a Viking meal.